Use the File > Save As command to save your file. Open the newly-renamed file to begin editing. 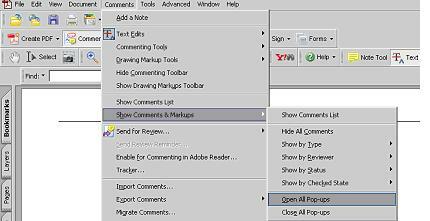 Using Acrobat 8.0, choose Comments > Show Comment and Markup Toolbar, or click on the Review & Comment button in the Acrobat toolbar. Figure 1 shows Acrobat 8.0’s layout. Figure 1: Acrobat 8.0 commenting tools are very much like real-life drawing and markup tools. Except cleaner. Figure 2 Acrobat 7.0 offers similar features. The Sticky Note (called ‘Add a Note’ in earlier Acrobat versions) tool is fairly intuitive: Select the tool, click in the PDF and type in the digital note that appears at the edge of the PDF page. You can move notes around the page by clicking on the top outline bar of each individual note. Use Comments > Text Edits > Indicate Text Edits to mark desired changes in the text. When using the Text Edits tool (figure 3), just pretend that you’re typing corrections, because in reality nothing changes. You’re not actually changing text in the PDF-you’re only indicating where changes should be made. To indicate that you wish to delete text, highlight the text and hit Delete or Backspace. The text is marked with a strikethrough. To replace text, highlight text and type the new text. Acrobat strikes through the text and populates the accompanying note with your new text. To insert text, click the PDF to create an insertion point and type the new text. The added text is displayed in the associated note. The Highlight Text tool lets you call attention to selected text, and the associated note holds your comments. To delete any comment, select the comment’s icon on the PDF and hit the Delete key. 3. Save your file, then send it off to your editor. Look to Acrobat’s Help Guide for more information on using the Comment and Review tools. Acrobat User Community (www.acrobatusers.com) is a good resource on wide range of Acrobat topics. « World Champions – Phinally! Very useful! I had a hard time explaining to a friend how to comment PDFs using Acrobat. Wish I had this tutorial at that time. I will be archiving this in the “How do I do that again?” folder. Thank you once again, mind-reader! I needed a tutorial to send to my staff on using Acrobat for comments. Here’s one that people often ask for on how to use Adobe Acrobat to review a .pdf document.